Linux Voice ranked ne as the third best editor for Linux! There are a few archives related to ne: the general distribution is a tar gzip'd file containing sources that should compile under any POSIX-compliant UNIX. The RPM archives provide easy installation on RPM-based distributions. If you use the Cygwin environment there is a version of ne compiled for it (you just have to untar it in the root directory). This version requires the last version of ncurses, but you can also get a termcap-based version that has no dependencies and starts by default using the built-in ANSI sequences. ne was originally developed on the Amiga and inspired by TurboText, a wonderful editor written by Martin Taillefer. Development moved then on Linux. Todd Lewis joined the development donating code he wrote to add features required at the University of North Carolina. 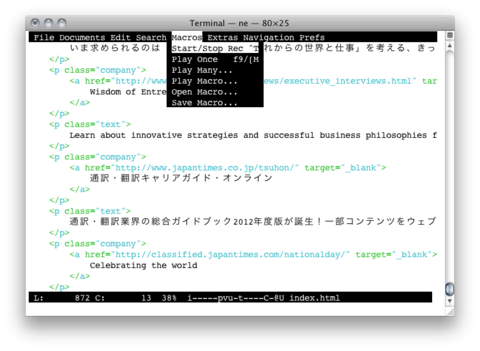 Daniele Filaretti helped with syntax highlighting. There is a discussion group about ne. You can join or send a message.